Several years ago, when I was teaching myself how to sew, a part of me was always a little scared to work with beautiful fine laces. The laces were always so perfect, so exquisite in their detailing that I just couldn’t bring myself to go anywhere near them with scissors. I had rolls upon rolls of the loveliest laces that I would admire but I had never touched with scissors but I knew that one day I would use them to create something beautiful. I remember telling my mum about this silly fear and she reminded me, in her own motherly way, that fine lace fabrics are made to be used and appreciated, and that I would be doing them an injustice by keeping them in the cupboard. My mother is a wise woman and she made a very good point. It was then that I found the courage to trust myself and my two hands. While I will always regard beautiful laces and fabrics as sacred and the ultimate indulgence, I came to realise that denying myself of these opportunities to be creative, to learn and to explore were even more sacred and I was doing myself an injustice. I love to sew because it forces me to slow down, to appreciate the finer details and to be present in the moment. Working with my wide range of laces and carefully hand-beading the darling details into place is one of my favourite things to do. I could do it for days on end, in fact, it’s something I often do and I then have to force myself to stop. I’d love to share with you today some small lace bridal hair combs I’ve been working on. Each comb is a blend of several fine laces in ivory tones, harmoniously brought together with a whole lot of love, patience and thought. I love the size of these smaller combs at roughly 4 t0 4.5 inches in length. A versatile size that can be worn in a wide range of bridal hairstyles including low chignons, side buns or loose curls. Handcrafted from corded bridal laces in the loveliest soft ivory tone, the “Emilie” (4.5 inches/11cm) embodies all that is feminine in old world glamour. Dazzling yet understated, I love the ornate lines of this piece and the precious beading in silver/ivory with subtle pearls scattered in between. When I first laid eyes on this beautiful embroidered lace in soft ivory, I knew I just had to have it. It was refined and exquisite in its simplicity, embroidered with no corded edge or defining details but featuring the loveliest floral patterns. It felt like a blank canvas and I was excited to see where I could take it. 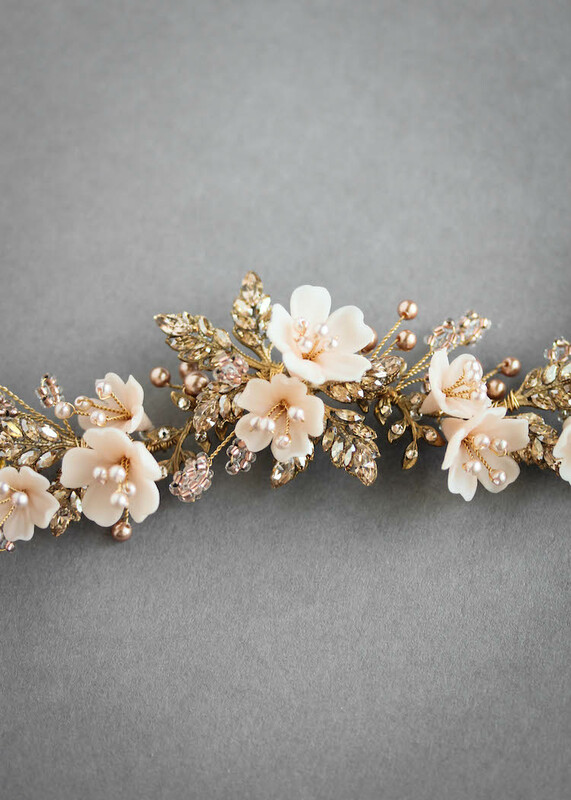 The “Rosalie” (4.5 inches/11 cm) is carefully embellished by hand using fine seed beads, pearls, rhinestones and crystals in a warm champagne/gold tones. This piece can also be made in ivory/silver instead or perhaps ivory only for a timeless look if your wedding dress or jewellery doesn’t feature gold or silver tones. The “Arielle” comb (4 inches/10 cm) is made from a beautiful Alencon lace in ivory with a distinctive corded edge. Whenever I think of a vintage wedding, Alencon lace is often one of the first things that come to mind. It’s a softly spoken piece full of vintage-inspired elegance and beauty that I just adore. Finished with a scattering of fine light ivory seed beads and pearls, this pretty piece would work beautifully in a bridal updo or it would be perfect to adorn a half up/half down hairstyle. Lovingly handmade from the prettiest corded laces in ivory, the “Mariana” (4.5 inches/11 cm) is all about effortless glamour. 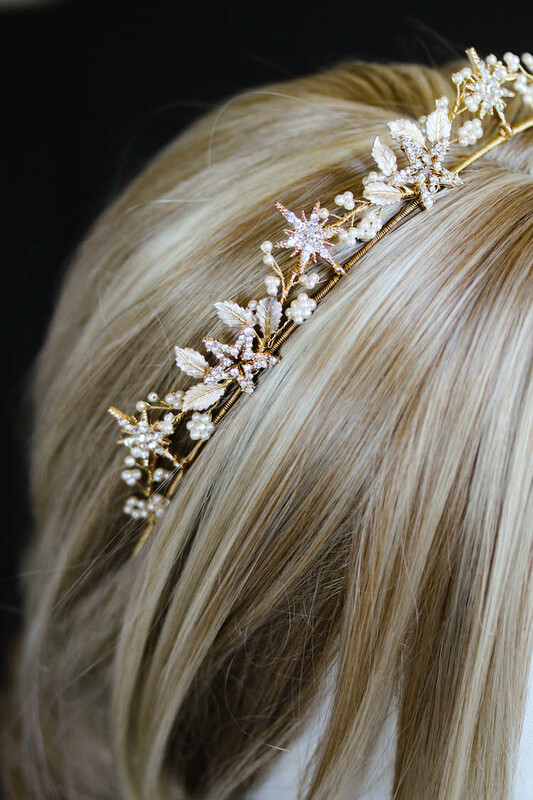 True to all of my designs, this piece is completely handmade and completely customisable so all aspects can be modified to suit your bridal hairstyle and the accents on your wedding dress. I’m head over heels in love with all the delicate layers and beading on this piece – the Mariana takes me to my happy place! If you’re inspired by any of these lace combs but would like some changes made, please don’t hesitate to get in touch. I’d love to work with you to create the perfect piece for your special day. If your dress features a different lace such as Chantilly lace or ribbon lace, feel free to send me a close up photo as I may have a beautiful lace on hand to match.